OTTAWA -- Prime Minister Justin Trudeau is putting taxpayer money where his government's mouth is, promising to deploy both financial and legislative tools to ensure the disputed Trans Mountain pipeline expansion between Alberta and British Columbia is able to proceed. At the same time, however, Trudeau -- speaking after a rare Sunday meeting with the warring premiers from both provinces -- concedes there is more his Liberal government is willing to do to protect the B.C. coastline from a possible oil spill. "The Trans Mountain pipeline expansion is of vital strategic interest to Canada," Trudeau said following the two-hour meeting. "It will be built." "We must recognize that they remain at an impasse, which only the government of Canada has the capacity and the authority to resolve," he said. "Our objectives are to obtain certainty with respect to the ability to construct through B.C. and for the protection of our shareholders in order to build the Trans Mountain Expansion Project," the company said in a statement. "We do not intend to issue updates or further disclosures on the status of consultations until we've reached a sufficiently definitive agreement on or before May 31 that satisfies our objectives." "I don't think we would be in this situation if the British Columbia government hadn't continued to emphasize its opposition to the project," Trudeau said. "That is why we are at this point right now." "Unfortunately, over the course of almost a year, they have not specifically put forward proposals on how they would like to see us improve the oceans protection plan," said Trudeau. "It's something we very much are open to doing." "We have been working at the official level for some time laying out concerns, and I was encouraged that today's meeting will allow us to get back on track in that respect," he said. Indeed, knowledge is limited when it comes to how diluted bitumen -- known colloquially as dilbit -- interacts with water, and how best to contain and clean it up. Dilbit spilled into Michigan's Kalamazoo River from an Enbridge pipeline in 2010 cost billions to clean up, with parts of the river closed for years afterwards. 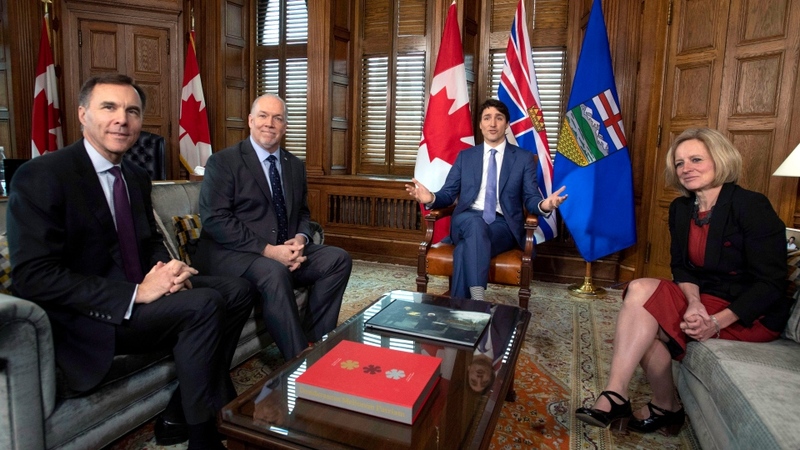 Notley, meanwhile, said she felt "a lot better" following the meeting -- and that once Morneau's talks with Kinder Morgan were complete, the project would proceed. "I'm quite confident that should these discussions end successfully, that the pipeline will be built -- and that is good, because the pipeline is in the national interest," she said. "His damaging policies ... have only led to more uncertainty and instability in Canada's resource sector," Scheer said, describing an energy sector that is now convinced that "Justin Trudeau does not want their business in Canada." Kenney repeated his calls for the prime minister to penalize B.C. by withholding federal dollars for infrastructure and jobs training. He noted Trudeau's father would not have stood for what the Horgan government is doing -- despite his reputation as an oilsands opponent. "I believe that (former) prime minister Pierre Trudeau -- who was no great friend of Alberta's energy industry -- would not have tolerated the ... lawlessness and violation of the Constitution that we are seeing right now," the United Conservative Party leader told reporters Sunday.